What is the ultimate test of how well you can play something on guitar? 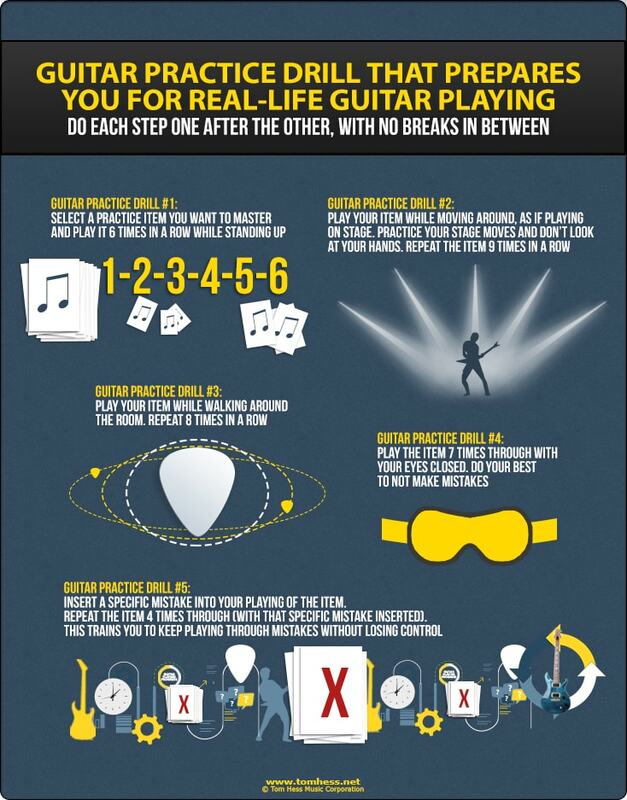 Answer: your ability to play at your best when it really matters most – I call this “real life guitar playing”. Playing guitar in front of other people without embarrassing mistakes. 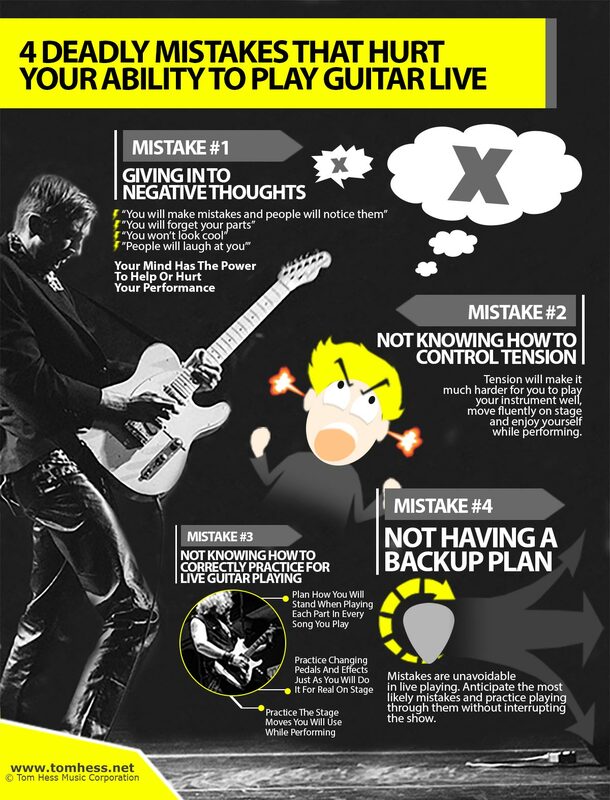 Train yourself to play guitar at your highest level. This means to continuously improve every area of your guitar and musical skills. Use guitar practice circuits to simulate real-life guitar playing conditions. You can customize these circuits to your needs, goals and experience level. Guitar practice circuit training is both very effective and very fun. This article explains how guitar practice circuits help your guitar playing. This sample guitar playing training circuit prepares you for playing guitar in real life. Do the following steps using a metronome (or drum backing track). Play everything at your desired goal tempo, unless indicated otherwise. Step 1: Choose something specific you want to master and play it while standing up for 6 repetitions. Step 2: Play the specific item you chose in step 1 while practicing your stage presence and movement. For example, hold the guitar up in the air and make cool arm and hand gestures to the audience. Do this without looking at your hands. Repeat this 9 times, but don’t play anything else other than the specific item you chose in step 1. Step 3: Play your item while walking around the room. Repeat 8 times in a row. Step 4: Play the item for 7 repetitions with your eyes closed. Do your best to play without mistakes (although mistakes will happen in this step). If you make mistakes, do your best to play through them while keeping your eyes closed. Step 6: Play the item 5-15 beats per minute faster than your top speed of consistent playing. Repeat 4 times. Repeat this circuit nonstop for 15-20 minutes. if you're suffering from stage fright, read this article. Play unforgettable live shows byusing these stage presence tips. In most real-life musical situations, you will be standing while playing guitar. Playing guitar while standing is harder than playing guitar while sitting. The guitar is less stable against your body. This makes playing more difficult. Practicing guitar while standing makes you confident with playing in this position. Good live performance requires movement. Simply playing the correct notes is not enough. Moving your body while playing helps you express yourself better. Additional challenge: Squat down while playing your guitar practice item, then slowly stand back up. This makes you accustomed to playing in unusual positions and helps your normal playing to feel even easier. Walking across the stage while performing, challenges your coordination and fluency. Mastering this element helps you create better stage presence. Tip: Pick out two points in the room and lightly jog between them. This makes playing MUCH harder. It also makes walking while playing feel much easier in comparison. Most guitarists are way too dependent on watching their hands every second when they play guitar. You might not always be able to see your hands when playing on stage. Sometimes the stage might be pitch-dark, other times a blinding light might be in your face. Practicing guitar with your eyes closed makes you less dependent on your eyesight. This helps you play well even when you can’t see yourself clearly. Note: Don’t expect to play perfectly with your eyes closed. You will make a lot more mistakes than usual (especially at first). Expect to make even more mistakes if your fretting hand has to make big position shifts. This is normal. Don’t become stressed out. The goal is to improve your ability to play without looking at your hands. The more you practice with your eyes closed, the more consistent your playing becomes. Playing at a faster tempo makes the original speed feel a lot easier and helps you play reliably without mistakes. Mistakes will happen when you play guitar live. Training yourself to play through mistakes helps you avoid falling apart and feeling embarrassed when you perform. Answer: You should insert any mistakes that are most likely to happen in the item you are practicing. Most common mistakes include: excess string noise, notes bleeding together, weak articulation on specific notes, hands out of sync on specific notes, out-of-tune string bends or playing out of time. Idea #1: Stand right next to the amp when you play guitar. Turn the volume louder than normal. Everything sounds and feels different when you stand very close to the amp. Get used to playing at your best even when the sound of the guitar is right in your face. Idea #2: Stand as far away from the amp as you can. Step outside your room and close the door (if possible) to make the amp sound distant. Everything sounds and feels different when you stand much farther from the amp than you are used to. Get used to playing at your best even when the sound of your guitar is far away from you. Idea #3: Play to a backing track that is turned up WAY too loud (much louder than your guitar). This forces you to play well even when your own guitar parts are drowned out by other instruments. (This happens very often when playing live). Idea #4: Play using an unfamiliar amp tone settings or a strange effect you aren’t used to. This pushes you out of your comfort zone and forces you to play better despite the poor tone. Idea #5: Play in a room that is way too warm (so warm that you begin to sweat). If possible, get huge light bulbs (or strobe lights) and point them at your face when you play. This simulates a realistic stage environment as closely as possible. Idea #6: Practice guitar when you are mentally fatigued (very early in the morning or very late at night). This challenges your ability to concentrate and makes your playing harder. Practicing in these conditions makes you a lot more confident about your skills. This confidence leads to much better and more enjoyable live guitar playing. Warning: don’t use this guitar practice circuit as a replacement for other practice strategies. Integrate it into your current guitar practice routine 3 times per week for the next month. Get used to the process and experience its immediate benefits. Continue using this circuit on as-needed basis to master playing guitar in real-life situations. Want to learn 5 more ways to make your playing sound better in the next 10 minutes? Download this free guitar playing eGuide & discover cool guitar playing tricks that you can easily learn today to have more fun and impress your friends with your guitar playing. Learn how to improve your guitar playing fast.